Home > Healthy Ears > What's the Point of Earwax? If you have problems with ear wax, and need to have your ear wax softened and removed regularly, you may be forgiven for thinking it is just a nuisance. Excess ear wax certainly is, but this substance is surprisingly complex and carries out an essential function. The technical name for ear wax is cerumen. It mainly consists of dead skin cells, and is around 60 per cent keratin, one of the main proteins found in the skin. It also contains waxy and fatty substances such as long chain fatty acids, cholesterol and squalene. It also has some complex alcohol molecules mixed in there, together with variable amounts of pigment. It may come as a surprise to know that there are two main types of ear wax and which one you have is generally related to your race. If you are white or Afro-Caribbean in origin, your ear wax is likely to be ‘wet’ rather than ‘dry’. It is usually a honey-brown, golden yellow colour and is decidedly squishy. The ‘dry’ type is less common but is found in people who originated in East Asia, or who are descended from native north Americans. It tends to be grey, dry and flaky. Where is Ear Wax Produced? The skin inside the ear canal contains two different types of glands that contribute to ear wax production – sebaceous glands and modified sweat glands. People who produce ‘wet’ ear wax have a greater proportion of sweat glands, which produce the extra moisture in the wax. Modern genetics has shown that the difference between people with the two different types of ear wax is only one tiny mutation in the gene that codes for sweat production in these sweat glands. It is thought to be related to lower overall body sweat production – and could have been selected for in populations in colder climates. The natural function of ear wax is to keep the ear canal clean. Just like the process that removes dirt and debris from the lungs, there is a slow-moving cellular conveyor belt in the ear that moves dead surface cells out of the ear constantly. The ear wax produced acts as a sticky glue to attract and trap dirt and debris, ensuring that this exits the ear as early as possible, rather than getting further down the ear canal. It also keeps the ear canal lubricated, preventing the underlying skin cells getting inflamed, sore and itchy. If you do have these problems with your ears, you may not be producing enough ear wax, rather than too much. Ear wax also contains compounds that inhibit the growth of many bacteria. This makes sense as the ear is an entry point into the body through which infection could gain a foothold. 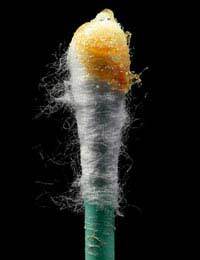 Ear wax also has anti-fungal activity. Excess ear wax can block the ear canal, causing hearing loss. A great many cases of mild hearing loss are probably due to ear wax, and the impairment clears up when the wax is softened by warm olive oil, or removed by syringing. Constant syringing, or attempting to clean the ear using cotton buds is not recommended; this over-stimulates ear wax production and can cause injury to the skin of the ear. Apart from the fact that a few people have thought it a good idea to take pictures of their ear wax and put them on the internet, another bizarre human use for the substance dates back to the Wild West, when it was an American Old Wives Remedy for cracked lips. Researchers have experimented with candles made from human ear wax and showed they can burn for a short while, but produce light too dim to read. Finally, ear wax is really useful for telling how old a whale is. Elderly whales apparently lose their teeth during old age – and carry on building up deposits of ear wax in their ear canal. The thickness of the ear wax is a good indication of how many years they have lived.